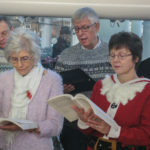 Quorum was founded in September 1989 as a group of ten singers to sing at the celebrations for the opening of the Dagnall Street Baptist Church, Cross Street Centre, Saint Albans. Ewart Hopkins became Musical Director in 1996, and the choir grew, first to sixteen, and later to twenty voices. With this increase in number, the choir needed more space, and made London Colney’s All Saints Pastoral Centre its main concert venue. It’s in this venue that the Quorum gained its reputation for the good tonal quality of its a capella singing. 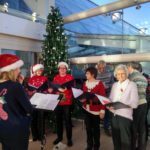 Constituted as a Charitable Organisation, the choir has raised many thousands of pounds for local and national charities. Over the years we have been privileged to join up with other choirs and musicians to share in music making, especially enjoying the opportunity to join the South Wales Male Choir in concerts at St Albans Cathedral. Since the closure of the Comper Chapel, the choir performs in many venues in St Albans and South Hertfordshire. 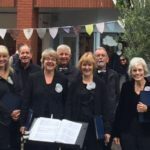 Now under the Directorship of Marianna Freeman, we are a self-financed, friendly four-part (SATB) choir of around 20 singers, performing a wide range of Sacred and Secular music, accompanied and unaccompanied. Marianna has developed the repertoire of the choir and has been instrumental in introducing works by local and contemporary composers, including many pieces composed and arranged by our former director, Ewart Hopkins. 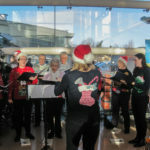 Quorum’s joyful singing continues to delight audiences with varied concert programmes to suit all tastes, whilst raising money for worthy causes. 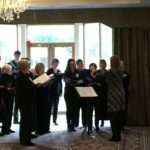 As a relatively small choir, we pride ourselves in ensuring our voices blend well for the music we sing, and we receive many compliments about the high quality of our tone and blend. After a successful recruitment campaign in late 2018, we welcomed 11 new permanent members in January 2019, bringing our numbers to over 30!